Architectural splendour Rashtrapati Bhavan is the home of President of India. It is located in New Delhi to the west of Rajpath. Built on 330 acre of land it consists of 340 rooms includes president’s house, offices, guest rooms and halls. The Bhavan is surrounded by beautiful greenery and garden. Built around Raisina Hills, it is surrounded by North and South secretariat, Parliament house, India gate. 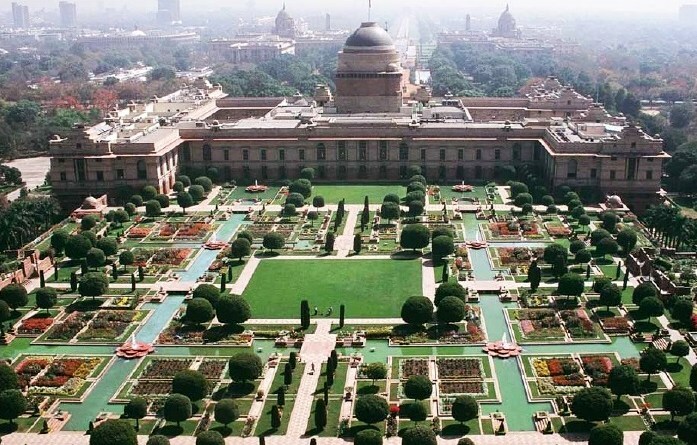 Rashtrapati Bhavan also consists of a beautiful garden called as Mughal gardens which are open to public from Feb to Mar every year. The garden is spread over an area of 150 acres which consists of different varieties of roses, Bounganvilla, Ayurvedic medicinal plants and many more varieties of plants. Rashtrapati Bhavan was designed by Edward Lutyens. The end of Mughal rule and the east India Company completely taking control over India it was decided to shift the capital from Kolkata to Delhi. It was decided to build a residence to British viceroy in Delhi. The construction was completed in the year 1929 under the architect Edward Lutyens. Lutyens travelled every year for 20 years to personally look into the construction of the viceroy residence. 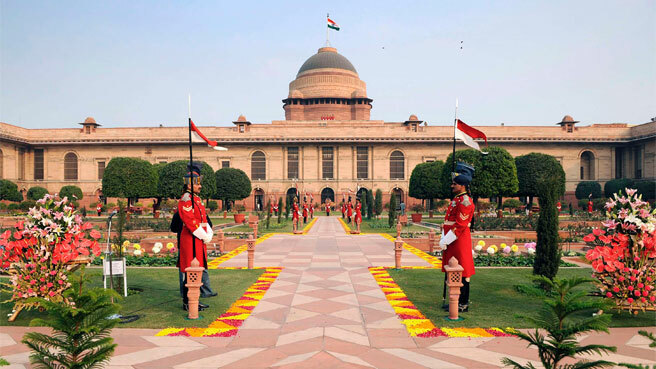 Rashtrapati Bhavan consists of two main halls called as Durbar hall and Ashoka Hall which is used for functions and other purposes. Durbar hall is a beautiful dome structure situated in the main building. The dome is 23 metres in diameter is beautified with various coloured marbles. Durbar hall has a space to accommodate close to 500 people. Jawahar Lal Nehru took oath as prime minister of India from British on August 15th 1947 in this hall. This hall was known as “Throne room” before independence which was having two separate thrones for Viceroy and Vicerine. Now it has one huge chair for the president. At the four corners of the hall it has two drawing rooms, the state supper room and state library. 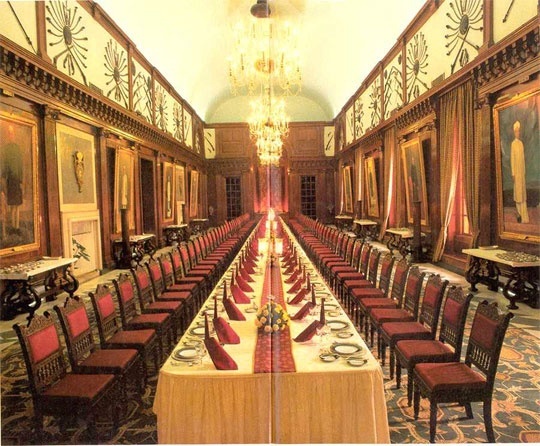 Ashoka hall is another hall which was originally built as a state ball room with wooden flooring. On the western side of the Bhavan are the raised Mughal gardens. Different Indian designs were included while doing the construction. There is a traditional chujja(a cover of a roof). It was a sharp thin protruding from the building which prevented sunlight from entering and also shields rain entering inside during monsoon season. Another Indian design used is ‘jallis’ made of red sandstone. These jallis are made in geometrical shape with floral design on it which beautifies the Bhavan even more. 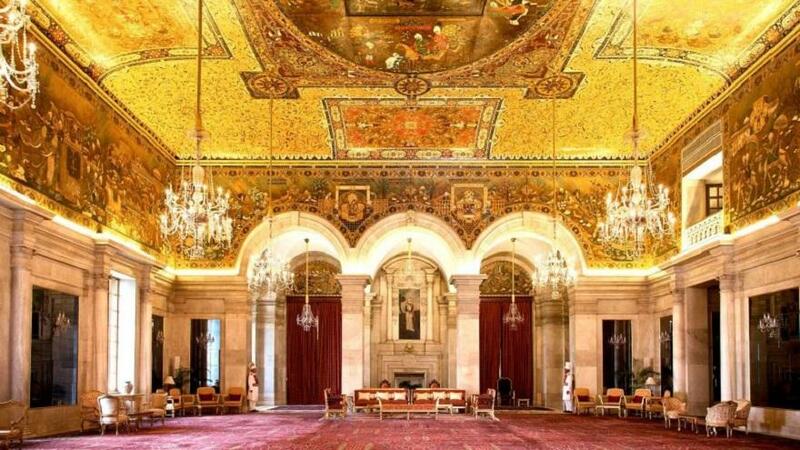 Rashtrapati Bhavan is blended with European and Indian style of art and architecture. The most beautiful structure of the Bhavan is the dome which was inspired by the sanchi stupa. Mughal garden further enhances the beauty of the Bhavan. A visit to Delhi means one has to plan well before to visit the different circuits in the Rashtrapati Bhavan along with India gate. Circuit 1 is the main building of the Bhavan along with the central lawn which opens on Friday, Saturday and Sunday to the public. Circuit 2 is the Rashtrapati museum complex which comprises clock tower, stables and the garages. This is open on all days except on Monday. Circuit 3 is the Mughal garden and other gardens of the Bhavan which are open august to march on Friday, Saturday and Sunday. Mughal garden is open from February till March. Important documents required: Indian citizens are required to keep a valid photo identity card. In case of foreigners they need to make a prior request along with a copy of their passport.. On the day of their visit the foreign citizens are required to carry the original passport along with them.